Another school year is winding down close and it’s time to start thinking about thanking the wonderful teachers and coaches who spend tireless hours focusing on helping our kids succeed! Every year parents seem to be stumped about what to give to teachers as a token of appreciation for their hard work. Why not check out your local vendors at Baseline Farmers’ Market in Sherwood Park for some really unique gift ideas? The best part is you’ll be supporting local businesses right here in our community! Here is a list of just a few ideas that you will find at our market. We have many vendors each week with interesting items, so be sure to pop in on Wednesdays from 4-8 to see these items and more. Express your gratitude with a unique, handmade card from Cards By Kaitlyn. Give the gift of delicious cookies from Confetti Sweets. This month they are featuring yummy lemonade cookies! Thank your teacher for being so sweet, with gourmet flavoured honey from Col-Lee Farm Fresh Honey or tasty jams and jellies from Barbara’s Pantry. Surprise your teacher with flavourful seasoning for dips and cheese balls from Party Flavours Gourmet Foods. For the coffee lover pop by Roasti Coffee for delicious, freshly roasted coffee beans. Save your teacher some time with gourmet, all-natural soup mix featuring soups that are ready in 30 minutes from Souptime. 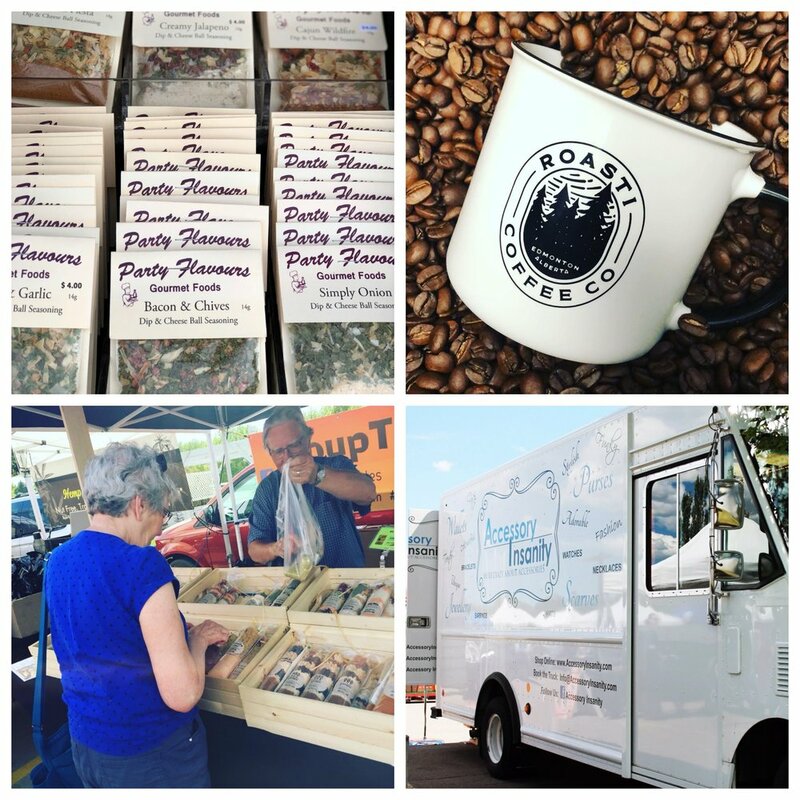 Take a peek inside the Accessory Insanity mobile truck where there are all kinds of neat gifts ideas such as jewelry, bracelets and much more. For the green thumb, give a beautiful plant from Herbal Roots. Delicious fudge or other treats from The Sweet Shoppe is sure to satisfy the sweet tooth. Or go back to basics and give your teacher a fresh, delicious apple (or basket of apples and other delicious BC fruit from Steve & Dan's. Be sure to check out all of our great vendors when you swing by the market, you may find the perfect gift that isn't already listed here! Baseline Farmers’ Market is located in the Home Depot Parking Lot on Baseline Road in Sherwood Park. Open Wednesdays, 4-8pm rain or shine!